Here’s how to attach the iPod Touch/iPhone screen film from iSkin without bubbles (and avoiding the seven layers of hell while doing so). Wear polyester based clothing (which doesn’t produce dust). Start the process in a room that is the most dust free in your house. Perhaps your kitchen. Have the screen film, the anti-static alcohol wipe, and a small bit of saran wrap handy. Wipe down the screen well with the alcohol wipe and hold the iPod touch screen up to the light to check for remaining dust. If there’s any you can see, keep wiping. When the screen is dust free, hold your iPod vertically, either on its side or standing up. 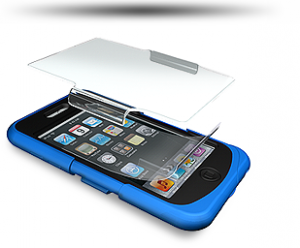 This prevents new dust from falling on the screen while you get ready with the screen film. Peel away layer A of the screen film and quickly start to apply the bottom edge of the film, holding the film like a playing card, touching only the edges (the film is quite stiff, allowing you to hold it like a card). The film will quickly start sticking or tacking onto the super clean iPod touch screen and will turn dark as it does, allowing you to easily see where the film has stuck or is still free or heaven forbid, has trapped some dust which will create a bubble. Don’t try to apply the film all in one go. Start from one corner and slowly work your way to the opposite corner. Rub the film with your thumb from one side to the other along the “tack front” as you slowly move up the screen. I recommend doing it not in a straight line but slighly diagonally like a guillotine blade. Before reaching to the final upper corner, place the saran wrap in the corner where the film will finish. This allows you to easily lift the film up to repeat if you messed up the alignment or if dust has gotten between the film & screen. If you’ve managed to trap dust between the film and the screen, air bubbles will be glaringly obvious. Don’t bother typing to wipe the dust off the film with your fingers or to squeeze out the air bubble with a credit card… it’s futile. Remove the entire film and go to the sink. Using a slow smooth stream of warm water, rinse the tacky side of the film. Don’t worry, there’s no glue to be washed away so this is safe. Shake the excess water off when finished. Use the alcohol wipe (which is likely dry by now) to soak up any remaining water droplets since it is lint & dust free. Repeat until you apply the film without dust and without bubbles. thank you .. this process worked wonderfully.. the first time even!